The Top Experiences To Enjoy While Cruising Aboard Miss Toronto! CORONA, hands down the number one selling beer on the Miss Toronto. Unlike other cruise boats we only serve Corona 'out of the ice in the bottle with a freshly cut slice of lime'. The way it is supposed to served and enjoyed. KEITHS, another import, drank in large amounts by all age groups. We also will stock anything that you want. If someone in your group still drinks Molson Golden, we will turn over rocks trying to find some. NOTHING IS MORE IMPORTANT TO US THAN YOUR ENJOYMENT WHILE YOU ARE OUT ON THE BRINE! RUM AND COKE, served with Fleur de Cana rum imported from Nicaragua. (the only ship in Toronto Harbour savvy enough to carry this fine spirit) This rum wins every competition that it enters and goes down as smooth as silk. Served over ice, with a generous squeeze of lime, (from the lime itself) and topped off with a splash of Coca Cola is the drink of choice for mariners the world over. The JAGERBOMB. A crowd fav, especially if you are under 30. Served fast, strong and hard by the pros at the bar on Miss Toronto. MEXICAN TEQUILA, Four brands of Tequila are available on the Miss Toronto. We serve two cold and two warm with lime and salt. This year we have shot glasses made of ice to enhance your shooting pleasure. ICE N VODKA, a short squeeze of lime, unsweetened Cranberry juice and a splash of soda is still one of the most refreshing summertime drinks out there. 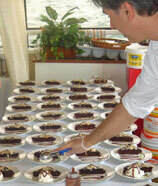 Afternoon corporate events or nighttime parties, this drink has been popular with all age groups. On board the Miss Toronto we take your drinks seriously! If we don't know how to make it, tell us. If we don't make it right, you don't pay for it. Yo ho ho and a bottle of rum we all look forward to welcoming you aboard! Premium cheese from around the world. Tangy, creamy, rich and dry, goes wonderful with a chilled glass of our Chardonnay. Served with cocktail rounds and gourmet crackers. Serves 25. Only the freshest locally grown and harvested fruit and berries will show up on this platter. Mouth watering, bite sized pieces of juicy fruit served with a tangy, summertime dip. Serves 25. Ola senor. Homemade guacamole and salsa served with warmed taco chips. Serves 20. A menu that we have been supplying in the past few years, we offer a variety of Basic, Veggie, Assorted and a MEATLOVERS subs. 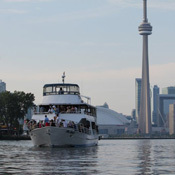 Experience yourself the many top's that a Miss Toronto Boat cruise can offer!